Hi, on my latest haul post, I bought 2 new hand cream from Tony Moly. I admit that I rarely use body lotion / hand cream or other lotion on my body. Simple reason, because I'm too lazy and hate sticky feeling on my skin. But, nowadays most body lotion / hand creams are absorp quickly and not sticky at all (Thank you for whoever invented it~). 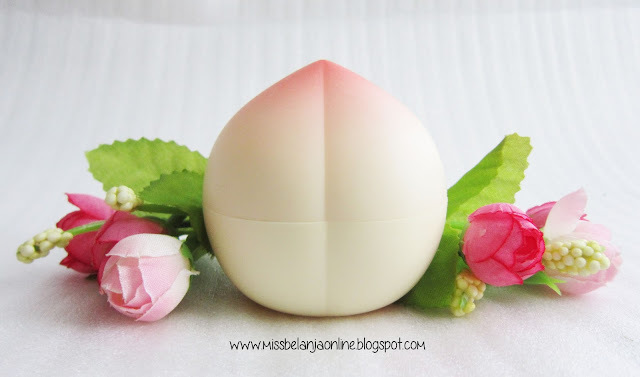 So, today I want to share my opinion about my Tony Moly Hand Cream. I also can't help but admire the packaging ideas. It looks like a real fruit. My mom also told me that it is really cute. The peach scent has peach as the packaging, so does the apple. It made from hard plastic, so I need to be very carefull not to drop it to floor. Though the packaging isn't really convinient for a daily hand cream (the tube packaging is better and more travel friendly), I forgive because it is cute. hehehehe~ Inside the packaging, there is another separator lid made from plastic. The texture of the cream is quite thick, white color, and have fruit scents. It absorb quickly, not sticky and left my hands smell like fruit for couple hours. It also works good to make my hand more moist. Well, I can decide my favourite between these two because the scent is quite addictive. The apple scent is sweet and kinda sour. It give fresh feeling after I used it. While the peach one is only sweet and it works like an aromatherapy for me. I love to smell my hand after I use this hand cream. So, have you tried this hand cream? done :) thanks for following! packagingan hand cream-nya cute banget kak, suka..